Point of view is the answer to the question “Who is telling us the story?” (or at least this scene). Are we watching everything from the outside, and a storyteller/author is telling the story? (= omniscient POV)? Or are we experiencing things through the senses of a character (might be first person POV, using “I”, or third person limited, using “she”)? Many people see point of view as separate and distinct categories, but I personally think it’s more of a continuum. One dimension that defines POV is how much knowledge readers have. Not all authors use it when they write from omniscient POV, so they are a tiny step more to the right of the continuum. She was a spoiled woman with a flair for the dramatic. I assume the character wouldn’t think of herself that way. So we’re certainly not in her POV. If no other character is present who thinks this about her, this might be omniscient. The storyteller is giving us his opinion on the character. Of course, omniscient POV can’t be judged by just one sentence or passage. I’ve seen a lot of novels whose authors thought they were writing in omniscient POV when they were really just head hopping. More to the right of the continuum is third person limited POV with multiple POV characters. Here, characters tell the story — different characters, but only one at a time, with no switches mid-scene! We only experience what the POV characters see, feel, hear, think, etc. That limits the amount of knowledge the reader has. In omniscient POV, you’re working from the outside in (“Red splotches formed on her cheeks.”). In third-person limited, you’re working from the inside out (“Heat crept up her neck.”). We’re not looking at a character; we’re inhabiting a character. Even more to the right on the continuum, further limiting the knowledge a reader has, is limited third person with just one POV character. The whole story is told from one person’s POV. It limits what you can show in the story. If the POV character is not present, you can’t tell it. And the most limited is first person POV. It’s very close to third person limited with one POV character, but even more intimate. Every word you write is filtered through the perception of the POV character. What’s the best point of view? Well, it depends. Personally, as a writer and a reader, I prefer third person limited, usually with multiple POV characters. As a reader, I find omniscient too distancing and as a writer, I find it too difficult to get right. I’m not really a fan of first-person POV, but a few of my favorite stories have been written in first person. So while most readers have personal preferences, it all depends on how well the writer handles point of view. If you’d like to find out more about the complex–and important–topic of POV, take a look at my writers’ guide Point of View. 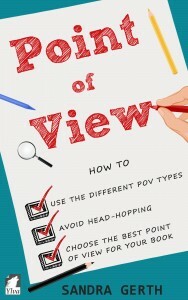 How to use the different POV types, avoid head-hopping, and choose the best point of view for your book. A wonderful introduction. However, you said that there would be more about authors who think they’re writing omniscient but are really head-hopping. Is that going to be in a later post? Thanks for reading, Amy. Oops. I took that passage out because the blog post became too long, but apparently forgot to take out the reference to it. Will do that right now. Thanks for pointing it out!